Like many Windows users, you may not know that you don’t need a mouse to move the cursor or pointer around the screen. You don’t even have to take your hands off the keyboard. Start learning the shortcuts for long-term efficiency. If you like the idea of giving your end users more tools to improve their job satisfaction and the companies efficiency, you’ll love this handy new resource. 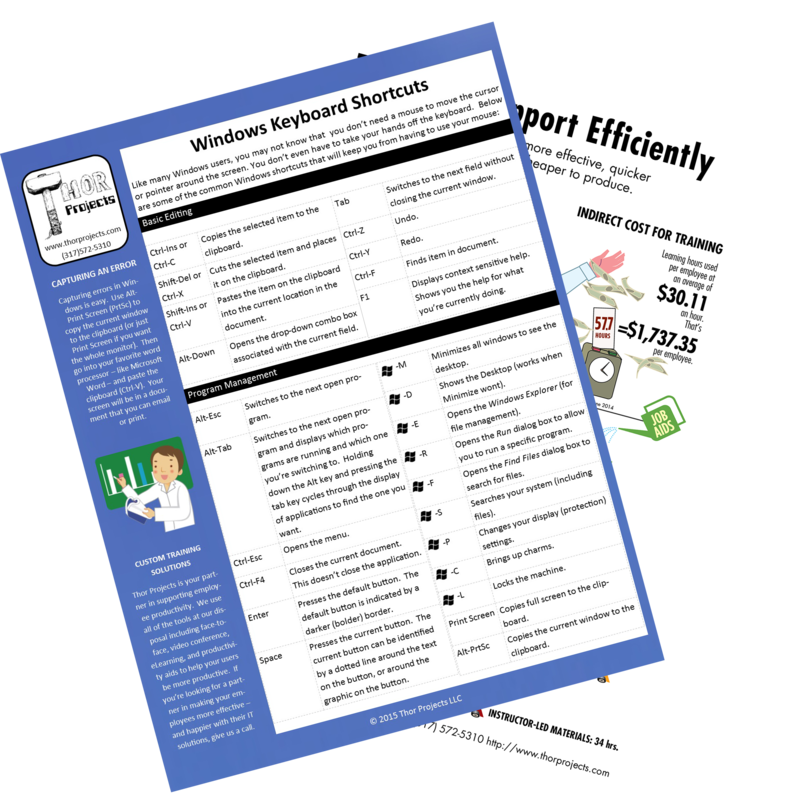 We’ve developed the Windows Keyboard Shortcuts Quick Reference Card as part of the series of tools we offer to promote user adoption and increased productivity. Click here to see it. Our Quick Reference cards are printed on heavy coated cardstock to withstand daily use and are intended to be handed out to folks to have at their desk to help them understand when and how to take advantage of keyboard shortcuts on Windows based computers. On one side you’ll find shortcuts with guidance on how and when to use them. On the other side of the card, users can see the advantage of utilizing a productivity aid after training. The Windows Keyboard Shortcuts Reference card is a tool your users want at their desks. Buy in Sets of 15.